Measure the root ball across the top and dig a hole at least twice as wide. The wider the hole, the better. Measure the root ball from top to bottom and subtract 2 inches. This is your measurement for the depth of the hole. Do not plant the tree/shrub too deeply. Remove the plant from the container. The roots of plants grown in a container may be pot bound. You MUST loosen the roots before planting. Use a shovel, trowel, or sharp knife and score the edges of the roots. Score the root ball 5 to 6 times, no deeper than a ј inch. Make sure as to not disturb the root ball too much. Place the plant in the center of the hole. 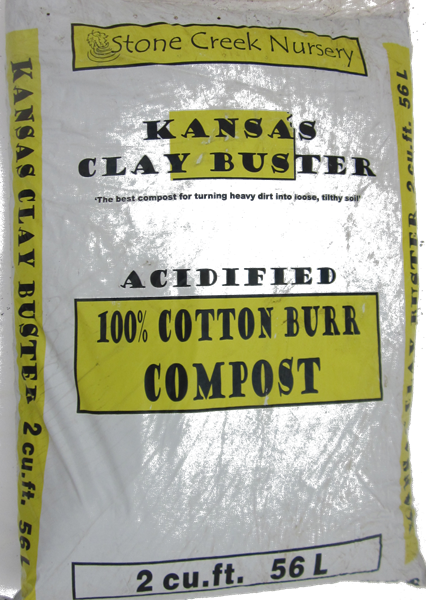 Refill the hole with a mixture of one part Kansas Clay Buster soil amendment and two parts original soil mixture. (soil you dug out of the hole). Do NOT put soil on the top of the root ball. After the hole has been back filled, slightly firm the soil around the root ball to make sure the plant is stable and secure (the looser the soil around the root ball the easier it is for the roots to start growing. Water the plant immediately after you finish planting with a solution of Ferti-lome Root Stimulator. Adding fertilizer is not necessary when planting a new tree or shrub. The plant’s new roots need to establish before fertilizer is applied. We recommend that trees and shrubs planted in the spring can be fertilized after they have gone dormant in the fall. Trees and shrubs planted in the fall can be fertilized in the spring before they leaf out. Using a good slow release fertilizer like Ferti-lome Tree and Shrub Food will provide all the nutrients the plant needs. Adding mulch to your garden beds is both aesthetically and functionally beneficial. Mulch retains moisture around the plant’s root zone, protects and insulates the roots, prevents weeds and makes your landscape look more complete. We carry two kinds of mulch. Cedar Mulch is known as one of the best-looking premium mulches available, offering long lasting beauty and durability and protective ground cover. Overall, cedar mulches are more popular with home owners as they are known for being an easily renewable resource and for the pleasant scent they give off. Cypress Mulch is very popular for a variety of reasons. Its resistance to floating, and blowing are a few of its features that make it a landscaping favorite. This organic mulch product resists fungus and retards weed growth. Do not use rubber, plastic, or synthetic mulch of any kind. Layer the mulch 1-3 inches thick throughout the garden bed or around the entire root zone of your trees and shrubs. Do not layer mulch directly around the trunk of any tree. Adding too much mulch around the trunk may cause the wood to rot and make the tree susceptible to disease and insect infestation. Always leave a 4-inch space between the mulch and the trunk of the tree or the base of the shrub. Proper watering is essential for newly installed plants. Under watering or overwatering your plants can kill them. New trees and shrubs may need to be watered on a schedule for as long as 2-3 years before they are fully established. Trees and shrubs absorb all of their water from their root ball for the first 8-10 months after they are planted. This means that plants may still need water even if the soil surrounding the root ball is moist. The best way to water new trees and shrubs is to place a hose at the base of the plant and adjust it until water is slowly leaking from the hose. Leave the hose in place and soak the plant for 30-60 minutes. You will need to adjust the watering time depending on the water drainage in your soil. Running water over a longer period of time will fully saturate the root ball and the surrounding soil. As we all know, weather in Kansas can vary daily and site conditions make it impossible to come up with a “formula” for how often you should water your plants. It is best to check the moisture levels in the soil every 2-3 days. Learn more by reading our DIY Watering Guide.